Sometimes Facebook is really handy. I subscribe to (or "like") the news feeds of various and sundry bloggers, news agencies, and chefs, and every once in a while, something interesting comes down the pike. 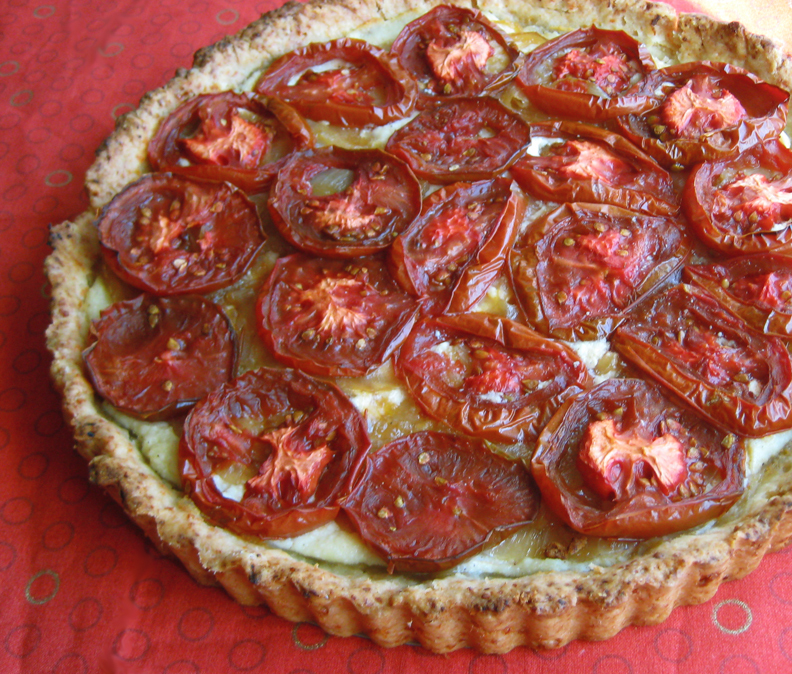 Like the other day, when America's Test Kitchen's feed included a recipe for a tart crust made with olive oil. Ordinarily, I would have scrolled past, but an image of the dough being dumped unceremoniously into the tart pan--without rolling--stopped me. That looked easy, and it certainly had to be tastier than an all-ready pie crust. Ok, so it was mostly easy, but there were still several steps. First I had to drag out the food processor to blend the crust ingredients. Then they were pressed into the tart pan - the easy part. But then the pan had to go into the freezer before blind baking, and then the crust had to cool before filling. After filling, there was a second baking. By this point, hours later, I thought maybe I should have just tackled bread-making. But the end result was pretty tasty, if not as flaky as the recipe's intro would suggest. The crust was more cookie-like, but not sweet. The recipe called for whole wheat flour, which I didn't have, but it was only 1/4 cup, so I didn't think it would matter. After tasting it, I think oatmeal might be an interesting addition, especially since the crust reminded me of a cookie anyway. The original filling called for zucchini, but I used all tomatoes. They look a little dark in the photos because I used the greenish-brown Kumato tomatoes, which are the only grocery store tomatoes that actually taste like, well, tomatoes. All year 'round (my unsolicited opinion). Place the flour, sugar, salt, and cheese into a food processor and pulse until combined. Drizzle in the olive oil and pulse about a dozen times. Add 4 tablespoons of the ice water and process until dough starts to form a ball. If the dough doesn't form a ball, or if there is still unincorporated flour in the bowl, add the remaining 2 tablespoons of water and pulse until it comes together. Put the dough into a 9-inch tart pan with a removable bottom and pat into an even layer on the bottom and up the sides of the pan. The dough will be very soft. Place the tart pan on a large plate or cookie sheet and freeze until firm, about half an hour. Preheat oven to 375F. Set the frozen tart on a baking sheet and press a double layer of foil into the shell. Fill the shell with pie weights (I use raw rice, which I save and reuse for the same purpose) and bake until shell is golden brown and set, about 30-40 minutes. Slide the tart shell onto a wire rack and gently remove weights and foil. Allow tart shell to cool completely before filling. While the shell is cooling, place the tomatoes on several layers of paper towels to absorb some of their moisture. Sprinkle with about half a teaspoon of salt and let sit for half an hour or so. Cook the onion in 2 teaspoons of the olive oil over medium heat until golden brown. Once tart shell has cooled and tomatoes have rested, adjust an oven rack to the middle position and heat the oven to 425 degrees. In a small bowl, mix the remaining teaspoon of oil and ricotta together and season with salt and pepper to taste. Spread the ricotta mixture evenly over the bottom of the cooled tart shell. Arrange the onions on the ricotta and top with the tomatoes. 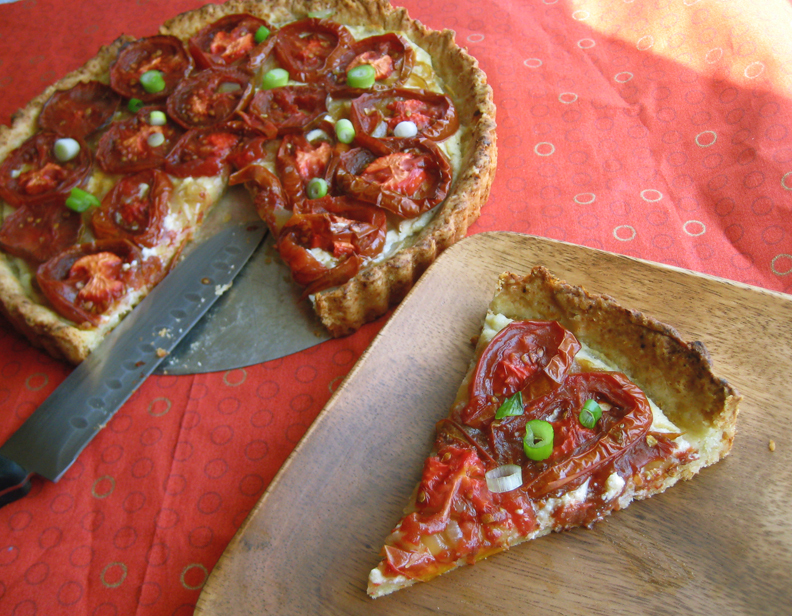 Bake the tart on a baking sheet until the cheese is bubbling and the tomatoes are wilted, 20 to 25 minutes. Let the tart cool on the baking sheet for 20 minutes. To serve, remove the outer metal ring of the tart pan before slicing. Garnish with chopped scallions.